The FIG and UNECE WPLA experts and delegates will join in Cape Sounio, near to Athens, Greece between 28th - 31 March. 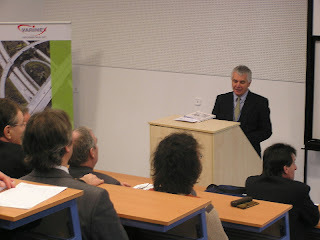 FAO Director General visited Budapest. The UNSDI Strategy document the basic findings and the contributions provided by the three pilot countries including Hungary were referred by this European Public Sector Information Directive related portal of the DG Information Society. In recent years, the use of computation-intensive techniques for spatial data processing and analysis has grown into an important scientific field. High Performance Geo-computation is the application of computational science to Earth sciences. It applies computational resources to various types of Earth science data, information, and models for solving Earth science problems. It develops discipline-specific theories, algorithms, architectures, systems, supporting tools, and infrastructure within the overall context of computational science. The areas of application for Geo-Computation include, but are not limited to, spatial data analysis, dynamic modeling, simulation, space-time dynamics and visualization, virtual reality, and applications employing non-conventional data clustering and analysis techniques. As one of the hottest topics in High Performance Geo-computation, Spatial Information Grid (SIG) applies grid techniques to Earth sciences and spatial information processing, and tries to provide a powerful and useful infrastructure for Earth scientists, researchers and application users. This workshop focuses on most of the topics in High Performance Geo-computation, especially in Spatial Information Grid and its applications. The 1st HPG was successfully held in Changsha, China in 2006. The 2nd International Workshop on High Performance Geo-computation and Spatial Information Grid (HPG’07) will continuously provide a forum for examining the state of the art of High Performance Geo-computation and especially the new development of Spatial Information Grid. It also provides a venue for scientists to network with their peers working in similar fields. Papers submitted to the workshop should not have been published or submitted for publication elsewhere. Submitted papers must be written in English, and the length of the papers should be no more than 10 pages in the standard IEEE single column format. (Formatting instructions available on: ftp://pubftp.computer.org/press/outgoing/proceedings/Instruct6x9.pdf). Please email your manuscripts in PDF to huangzc@tsinghua.edu.cn with the email subject as “HPG’07 paper submission”. Submission of a paper will be considered an agreement that, should the paper be accepted, at least one of the authors will register for GCC2007 and attend the workshop to present the work. All accepted papers will appear in the conference proceedings together with other GCC2007 workshops published by IEEE Computer Society (pending). The overall purpose of the Joan Blaeu @ Prize, established in the context of the UNGIWG-UNSDI and INSPIRE programmes, is to select examples of best practices in applied Geo-informatics, with emphasis on underdeveloped rural and suburban areas and their population. The reason, why rural and suburban areas were selected for the 2007 Prize is, that rural regions are usually and particularly in the technological sense, underdeveloped, the main focus being generally on development of big cities. The rural areas cover 80 percent of Europe and coverage of other continents like Africa, South America and Asia is higher. Most of environmental applications are also related to rural regions. So there is chance for exchanges of experiences among countries and regions. 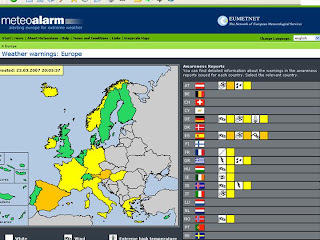 The aims of the Prize are: to promote existing, in fact working, accessible and intelligible solutions, based on open technologies and standards, to minimise the negative impacts of e-exclusion in society, to improve the overall knowledge of the applied geo- and environmental sciences, to support inexpensive yet complete solutions, and effective working groups. Organizers seek to spotlight positive, creative tools and environments for mastering existing geo-information and knowledge databases, to highlight ongoing live projects serving to better territorial management, nature conservation, regional development, education, to better understanding the top-down and bottom-up processes between the global-local levels, to understanding the position, the active role of GIS users, and offering solutions to existing problems. The secondary objectives are an improved level of service and infrastructural environment, including the spatial data infrastructure, for improving quality of life, bridging cultural differences, and support to local economies. Sustainability principles here refer to the environmental, economic and socio-cultural aspects of applied SDI, and a suitable balance must be established between these three dimensions to guarantee its long-term sustainability. 1) make optimal use of geo-data and geo-information resources that constitute key elements in administration, economic development, maintaining essential ecological processes and helping to conserve biodiversity, and the nature. 2) respect the socio-cultural authenticity, conserve and promote the built and living cultural heritage and traditional values, and contribute to multi-linguality, and inter-cultural understanding and tolerance. 3) highlight and account long-term economic intentions, geographic dislocation of economy, its sources and impacts, distribution of facilities and networks providing socio-economic benefits, including stable employment and income-earning opportunities and social services. This competition invites all types and sizes of educational institutions, administrations, companies, and/or NGOs active in any region of the world, using geographical information at any level, from local through regional, national, continental, to global level. The application should be submitted by organizations providing or facilitating geographical content, or geo-information services to end-users. Special attention will be paid to suburban and rural territories. They must be submitted by an individual representing the applicant, or a team. The application must be web-based. The application must be written in English language and sent in digital form. Web address has to be given in order to verify the functioning of the system. Application has some proven efficiency, applicant enclose credit references, evaluating reports and the like. In order to make the adjudication process smooth, a selection process will be performed. The judging procedure will be based on the expertise of the pre-selection committee and an independent international expert jury evaluation. Each proposal will be evaluated by five independent Jury members and result score will be average of these individual scores. In order to narrow the 10-15 nominees down to a winner, the finalists can be asked to submit more detailed information. All nominees will be informed of the outcome, including the finalists. The final jury decision will be carried out at the ISZL conference. At this stage, finalists, i.e. one representative from each of the three competing teams will be invited to exhibit their project application and present a talk at the conference and award ceremony. The jury shall decide upon the winner according to the scores given in the second stage, in the exhibition and in the oral presentation given at the conference. Every presentation will be evaluated by three independent Jury members and result score will be average of these individual scores. These results will be added to score from second steps. 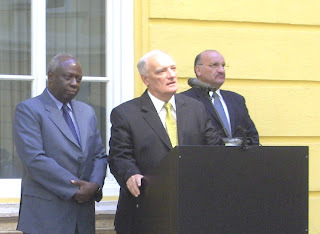 The final jury report will be produced and announced during the Award Ceremony on in May 2007, in Prague, Czech Republic; furthermore presented on the UNSDI and INSPIRE websites as well as in other media. The jury is composed in line with UNSDI and INSPIRE principles, thus constituted by personalities/institutions of recognised technical and scientific prestige bringing an area of expertise to the task as well as reflecting a balanced geographical representation. (b) or off-line, by downloading the entry form in “pdf” format from the website http://www.iszl.cz/index_en.php or www.unsdi.cz and sending it as an e-mail attachment to JB2007Prize@ccss.cz (with the following title: Application for JB@P 2007). A) The entry form shall present objectives, preliminary results and practice on maximum of six pages, in English. B) Entrants shall attach a maximum of 5 high-resolution (2048x1536 pixels) photos to the application, which are to be used in the promotional activities and official promotional material on the project. Finalists are subject to producing further verification and more detailed information if requested by the jury. All materials submitted remain the property of the (ISZL/ISAF Conference). On the UNGIWG-UNSDI and INSPIRE websites the electronic entry forms will be available and stored in order to build an address database for the next award, and for the post-award promotional activities. Regarding the entries related with the awarded applications, the organizers reserve the right to use them and publish, either totally or in parts, at the conference and awards ceremony or in any other form of media. The name of the awarded application and author organizations, and reference to the JB@P will be cited in such cases. A complete proposal consists of: [A.] Maximum six-page (A4) entry form, which is filled in electronically in the English language. [B.] Maximum five high-resolution (2048x1536 pixels) photos presenting the sustainable destination [C.] Printed Poster with digital copy for CD (recommended, finalist duly). The overall framework of the Conference & Award are the UNSDI, INSPIRE and EFITA-EUROGI networking policy and activities, and possible next projects. The aim is to further facilitate capacity building by developing efficient and innovative tools and specific knowledge for sustainable development in relatively handicapped rural and suburban areas. The venue will include a scientific and commercial exhibition, a poster exhibition presentation of best practice of the three nominees for the award, as well as relevant organisations and companies, who would like to showcase at the event. High profile speakers are invited from the European Commission, EFITA, EUROGI, United Nations, European Agencies and other organisations. It is estimated that the event will attract approximately 50 international delegates engaged in GI matters and usage at Global, European, national, regional and local levels. Winners and finalists will be actively promoted to relevant stakeholders and media. The conference will be followed in the evening by a Gala Dinner where the first three winning projects will be presented. European Commission and European Institute, FAO, Czech National and regional Government and journalist VIP’s are invited to attend the Gala Dinner and Award Ceremony, and asked to give a short speech, present the winners and deliver the prize. 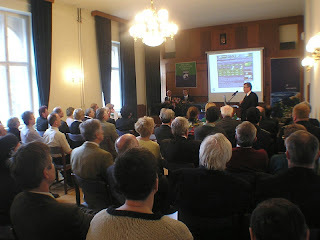 The event will be staged in the Congress Centre at the Czech Agricultural University in Prague. The award scheme aims at raising the GIT credibility and broad usage of geo-information for sustainable development in e-excluded or handicapped rural areas both in the public perception and at national, regional and local government levels, and at demonstrating for the businesses and governments the benefits and advantages of SDI. The nominees will be guests of honour at the award ceremony; accommodation and meals for two delegates are provided and they are also invited to present their best practice examples at the conference. To obtain further details on the competition, see www.unsdi.cz or contact the jb2007prize@ccss.cz . Hungary was represented by UNSDI HUCO/HUNAGI and FÖMI, but the HUCO presentation was delivered based on the contributions of its stakeholders including Ministry of Environment and Water, FÖMI, VÁTI, MoD Mapping Company and the Hungarian Meteorological Service. The Térinformatika Journal and HUNAGI prepared flyers, VÁTI dedicated poster on TeIR for the event.